Join us on an action-packed family adventure across this spiritual island. 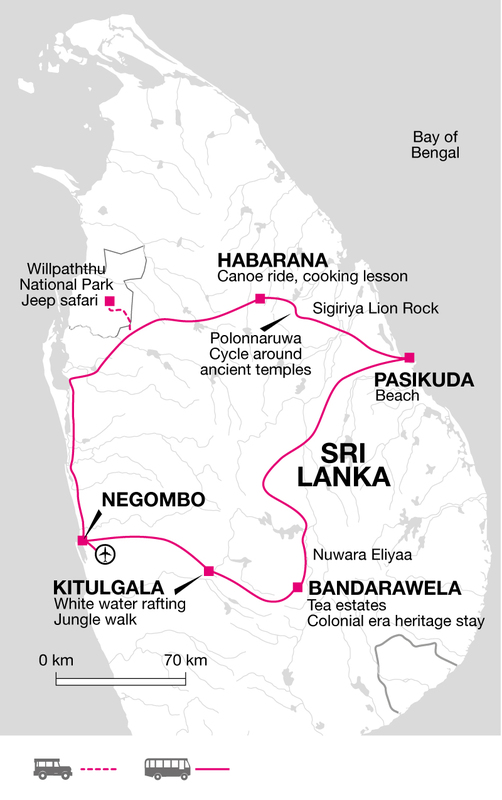 We search for leopard in Wilpattu National Park, staying overnight in a tented safari camp; cycle the backroads to discover ancient Buddhist cities in ancient Polonnaruwa and raft the white waters of the Central Highlands topped off with time to relax on the white sandy beaches of this tropical paradise known as 'Buddha's Island'. Blessed with sun soaked beaches, wonderful cultural sights and a breadth of fun activities, its little surprise that Sri Lanka is one of our most popular family holiday destinations. Fitting into just one week, this trip is ideal for either October or February half term, escaping the long winter nights or over one of the school holidays. We offer an east and west coast version of this family holiday to benefit from the best weather conditions on each coast, staying on the east coast over the summer holidays and October half term and switching to the south west coast over Christmas, February and Easter. Our tour begins this afternoon in the small town of Negombo. Our hotel is set on the beach front offering the chance to watch small fishing boats come ashore and the sun setting over the ocean. 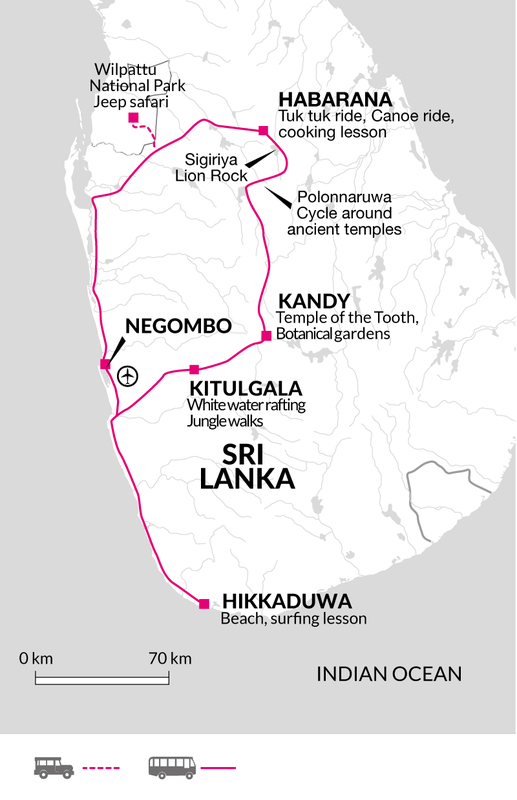 Day 2 - Drive to Kitulgala, adventure capital of Sri Lanka. White water rafting and jungle walks. Stay in a jungle Camp. Drive to Kitulgala, a journey of around three hours. Set amongst the fertile and lush western highlands with towering cliffs and wild water, the Kelani Ganga provides some of the best white water rafting in the country. The grade 2-3 rapids provide us with the perfect combination of scenery and excitement, as we spend raft down to our accommodation in Kitulgala. We cover a seven kilometre section of the river through eight rapids. It will usually take approximately one to two hours to cover the section but this depends on water levels. We should arrive at our overnight lodge late this afternoon. This evening there will be a chance to join an optional trek across the river and through the jungle to a hidden waterfall. Our night spent at Kitulgala is more basic with ten eco lodge tree houses roofed with palm leaves set two meters above ground level. Huts are open to the forest, providing a close to nature feeling, the sounds of the river running close by only adds to the feeling of being in the wilderness. All beds are fitted with mosquito nets. Day 3 - Visit a tea factory in Nuwara Eliya, continue to a colonial style hotel in Bandarawela. Walk up to the sounds of birds in the jungle. After breakfast head off across the highlands to the hill station of Nuwara Eliya. The area around Nuwara Eliya is the heart of the island's tea industry and we will visit one of the many estates to witness the production processes and sample the finished product. The air is noticeably cooler as we enter a world of round green rolling hills covered in tea plantations. We continue our journey into the heart of the central highlands, arriving in the late afternoon at the bustling market town of Bandarawela where we stay in a delightful colonial style hotel with fine views of the neighbouring mountains. Day 4 - Leisurely morning. Drive to Passikudah beach on the Indian Ocean. Enjoy a leisurely start to the day. We leave mid-morning, driving to the east coast resort on Passikudah beach. The next day and a half is free to enjoy the laid back ambience and turquoise waters of Sri Lanka's east coast. Rich in colonial history and golden beaches, the region offers us a wealth of options to enjoy the most of our time here. Our hotel has a swimming pool and has easy access to the beach. Day 5 - Free day to enjoy the beach. Passikudah has one of the finest beaches on the east coast of the island. The protected reef runs the length of the way making it an ideal resort for snorkelling and the shallow waters enable wading out 50 meters from the shore. For active families, there is a wide choice of water sports on offer, alternatively sit back and relax on the golden sandy beach or take a dip in the hotel swimming pool. Day 6 - Share a meal with locals in Habarana, travelling to the village by canoe and bullock cart; cycling tour of ancient Polonnaruwa. Heading inland we drive two hours to Habarana, the cultural hub of Sri Lanka. Swapping our bus for a bullock cart, we make our way slowly through a small village on the outskirts of Habarana to a lake where we change seats again, this time into a dugout canoe - adapted with seats for a more comfortable ride. We cross the lake to Hiriwaduna, a small village where we are met by the villagers and treated to a traditional Sri Lankan lunch. We can watch as delicious curries and fluffy rice are prepared and try out creating a traditional spicy sambar. After sharing the meal and spending time in the village we make our way back to our bus and onto Polonnaruwa, just under an hour's drive. This afternoon we visit the ancient city by bicycle and on foot, taking in the spectacular ruins of the Royal Palace and its Audience Hall, Bathing Pool and Quadrangle - a wonderfully compact collection of ruins. We stay overnight close to Polonnaruwa. Day 7 - Climb to the top of Sigiriya's dramatic Lion's Rock, take a jeep safari in search of leopards in Wilpattu National Park, overnight tented camp. An early transfer this morning takes us to the start of our ascent up the imposing Lion Rock for the climb to the redoubtable Sky Fortress, soaring dramatically up from the flat central plains. The ruins of this 5th century World Heritage site fortress are one of Sri Lanka's major attractions. A switchback series of steps (sometimes very steep and somewhat precarious) ascends to the top and half-way up, tucked beneath a sheltering overhang of rock, are the famous Sigiriya Damsels. These frescoes, their ancient colours still glowing, once covered an area of some 140 metres in length and are the only ancient non-religious paintings to have survived into modern times. On arriving at the summit (200m) we are presented with some magnificent views of the surrounding countryside, as well as the remains of what is left of the palace of King Kassapa. Leaving Sigiriya we drive to Wilpattu National Park. Here we will leave our bus and change to jeeps for an afternoon safari through the park hoping to spot Sri Lanka's most elusive resident, the leopard. Despite Wilpattu National Park's location in Sri Lanka's dry zone, it boasts nearly 60 lakes and is renowned for leopard, elephant and sambar deer sightings. Tonight we stay in a large fixed tented camp located close to the Southern boundary, on the boundary of a lake surrounded by bush forest. Each tent is well appointed with raised beds and comfortable mattresses, there is plenty of space to move around; en-suite private bathrooms are located in adjoining individual tents. Pillows, bed linen, towels, a flashlight and an umbrella are also provided. In the evening guests are invited to retire to the campfire after dinner. Day 8 - Morning game drive, continue to Negombo. Rise early for a game drive in Wilpattu National Park and a further opportunity for wildlife viewing, returning to our camp for breakfast. We make the final part of our journey by bus, returning to the small town of Negombo for our final night in Sri Lanka. The afternoon is free to enjoy a dip in the Indian Ocean or relax by the pool. Day 9 - Trip ends in Negombo. After an early breakfast we take a short transfer to Colombo Airport where the tour ends. Lightweight shoes and sandals. Be prepared to get footware wet on the whitewater rafting and canoeing activities. A water bottle and a torch. Whilst camping all bed linen is supplied on our overnight camp - there is no need to bring any extra equipment or sleeping bags.You may like to bring your own snorkel and mask for the nights on the coast. Bring a torch. Also high factor sun protection and a hat. We recommend Factor 30 plus for snorkelling as the water intensifies the sun's strength. A waterproof bag will also be handy to store personal possessions for the white water rafting and canoeing activities. For this we suggest £20-25 per family member. Standard - We have endeavoured to provide as much variety as possible on this family adventure holiday in Sri Lanka. Our mid-range accommodation offers a good level of service often with other amenities such as a restaurant, bar, garden or swimming pool. Generally rooms will be comfortable with en-suite facilities. In Wilpattu National Park we stay in tented camps located close to the Southern boundary, on the boundary of a lake surrounded by bush forest. Beds are raised and are fitted with comfortable mattresses; private bathrooms are en suite adjoining individual tents. Pillows, bed linen, towels, a flashlight and an umbrella are also provided. In the evening guests are invited to retire to the campfire after dinner. Our one night spent at Kitulgala is more basic with ten eco lodge tree houses roofed with palm leaves set six feet above ground level. Huts are open to the forest, providing a close to nature feeling, the sounds of the river running close by only adds to the feeling of being in the wilderness. Traditional Sri Lankan cuisine is excellent, and although it can be very spicy there are many dishes that feature cooling coconut milk or have a spicy sambar, a lentil based vegetable chowder on the side to allow you to adjust the meal to your taste. There isn't a culture of eating out in Sri Lanka, most locals will eat at home, and as such there are very few restaurants around, and those that exist tend to be in hotels. You'll have a chance to try home cooking on day 3 in Habarana when we have a cooking demonstration followed by lunch with a local family. As tourism develops a few independent restaurants are beginning to appear, mainly in Colombo but also in Kandy, Galle and in the coastal resorts. During the tour we will endeavour to eat out at local restaurants wherever possible but for many nights the hotel restaurants are the only option available. Fitting into just one week, this trip is ideal for either October or February half term, escaping the long winter nights or over one of the school holidays. We offer an east and west coast version of this family holiday to benefit from the best weather conditions on each coast, staying on the east coast over the summer holidays and October half term and switching to the south west coast over Christmas, February and Easter. Triple Rooms: This trip allows the option for triple rooms to be included within the booking on all night stops within the holiday except for the tented camp at Wilpattu. If you would like this option, please ask our Sales team for further information. Average Age: As a guide we have estimated the average age of the children who have travelled on similar trips over the the last 5 years, to help you decide whether it's the right one for your family. The projected average age on this trip is 13 years old, this trip is suitable for children of all ages. Sri Lanka is a compact country of amazing diversity, allowing families to explore the very best of the country in just nine days, enough time to fit into half term breaks or the main school holidays. It's an ideal destination for children of all ages with short travelling times and plenty of variety to keep the whole family entertained from white water rafting on the Kelani River to surf lessons on the Indian ocean (west coast version). Visit the immense rock at Sigiriya that soars dramatically up from the flat central plains is the site of an impressive summit fortress, take the train up the west coast to the capital Colombo and spend a night under canvass as we visit Wilpattu National Park in search of Asian elephant, leopard, sloth bear, spotted deer, buffalo, sambar and mongoose.